Thanks so much, your service and great pricing will be remembered! I've got a few friends in need of some equipment and I'll be sure to send them your way. Single RCA Wall Plate Coupler, Black Indicator (Gold Plated) + FREE SHIPPING! We all know that some of the best things come in small packages. Cupcakes for example. And let's not forget these cute little RCA Wall Plate Couplers. All shiny and gold they are perfect for customising your very own wall pates to complement your home theatre system or cables with RCA connectors. Featuring a corrosion resistant 24k gold plated body with precise fitting connectors and an easy to mount, screw on design creating your very own wall plates has never been easier. Your home theatre setup will look as tidy as possible, with no unused or empty connectors sitting around tempting you to buy more expensive equipment just to use them! 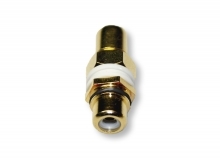 This RCA Coupler has a Black Indicator to help colour code your wall plate, and can be used with Component RGB cables/connectors and Left and Right RCA Audio. Only 8 left in stock!!! Very happy with the service. Product arrived the next day (sooner than promised!) and worked perfectly as per description. Well done - my future cable needs will be met by you.